Will give each a cool. Thank you very much! I have given Abra and Maria their needed stickers, too! Ronan just needs 1 retro sticker now. But I'll be okay if he doesn't get it. Awesome! Thank you! You all make playing this game worth it! Zoey is trying for Nerdy. Ronan is trying for Fabulous. Bradly is also trying for Fabulous. And Vivienne is trying for Cool. Zoey needs 1 cool and 2 nerdy. Ronan needs 1 cool and 3 fabulous. Bradly needs 3 fabulous and 1 nerdy. How are your sims doing? What do you guys need? I think we can recognize your sim's wishes! But I have lost Zoey. Wish, I could remove other sims instead of losing the ones I want to see in my contacts. I also tried to dress my sims for stickers. Earlier this week I had lost almost all of SKatF's sims. I was very glad to see her at a party so I could make her sims contacts again! I've given Mick a fabulous sticker, Mina a cool sticker, and Leigh a fabulous sitcker. 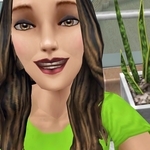 Interestingly, your sims were not dressed the way you have them in your pic! It often takes some time until the changes appear in friend's games. Sometimes I think, they only refresh if they're met at a party. But next time changes appear right after reopening the game.